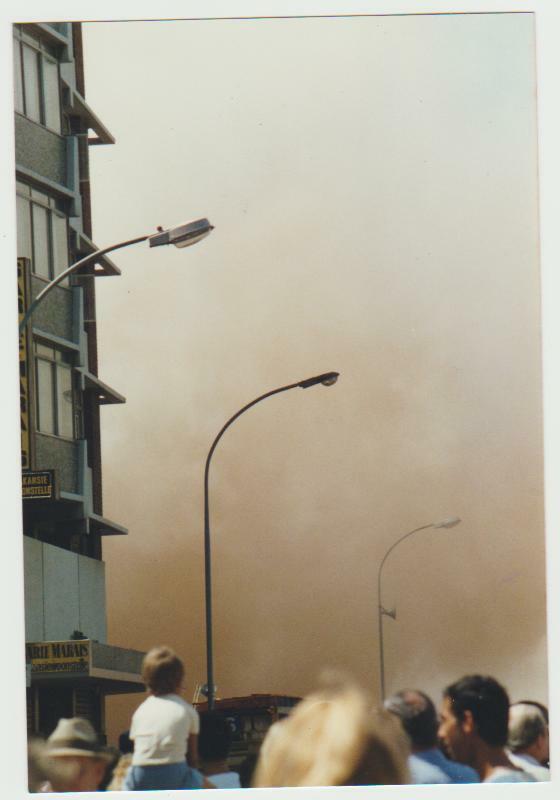 I was going through some photos and came across a few I had taken of Durban’s first implosion. I cannot remember the date but it was in the 1990s if I recall. The location was Point Road and the building was a derelict block of flats. I could not remember the street number but luckily the one photo shows the building next door which was the Sarie Marie Holiday Flats and that was 542 Point Road. I have no idea what the name of the multi sided building in the background is. 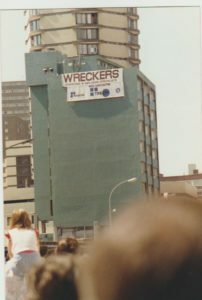 The implosion took place on a Sunday and was set for noon. I was wondering whether there have been any other implosions since then. Anybody remember the name of the building imploded? Very interesting. There have been a fair few implosions in Durban and I’d be surprised if this was the first if it was in the 1990s. They must have gotten rid of Congella power station somehow and assume they must have imploded the towers. Our next door neighbour’s son was involved in some implosions in Durban including one in the middle of the CBD. I remember his mum being very nervous about that one. There was also a big implosion of grain elevators or some such down on the bay and I recall we were all lined up to photograph it when a ship sailed in front of us at the crucial time. The charges didn’t go off for some reason and they did it another time. 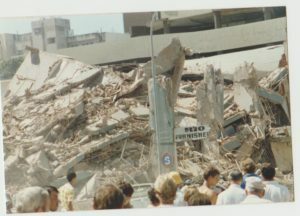 The only other implosion I recall was the demolition of the Pinetown Power Station but that was outside Durban. Congella Power Station I do not know how that was demolished. I recall that the demolition of the Methodist Church in West Street was done by wrecking ball as I have a slide of that somewhere. The old Beach Arcade upper West Street (where Mykonos Restaurant was) was also a wrecking ball demolition. I remember this implosion very well because I was working at Steers fast food take away on corner of Smith Street and Point Road and had just opened the doors and was standing outside the shop when the building came down and I then had to rush to get the doors closed before the dust cloud covered the whole area and would definitely covered the tables cookers and floor had I not got them closed in time. It was a weird feeling with ground shaking when the building came down. Can you remember the year as I have forgotten. 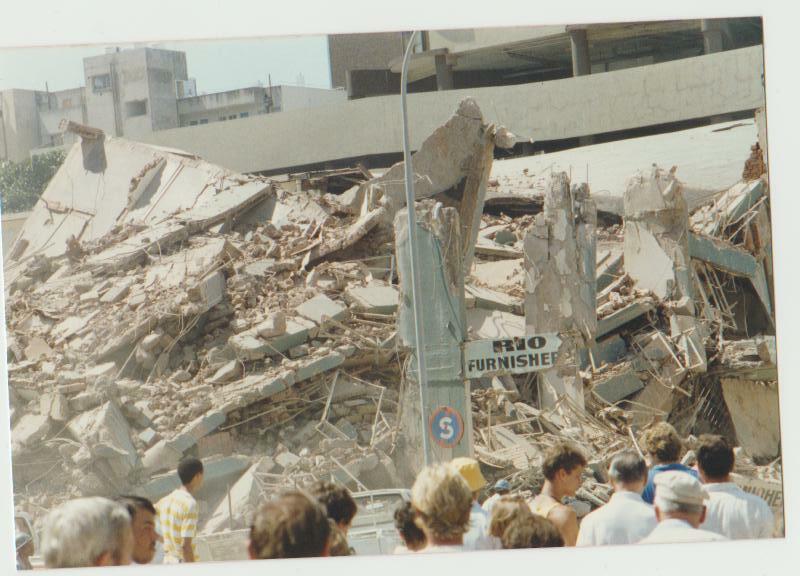 Hi There , I remember this very well it was late 80’s and this Building was demolished to make way for the now known ” Wheel Shopping Centre” , the building that was demolished had a furniture store on the ground level which use be called RIO Furnitures it belonged to my Dad. Hi Gerald … Please could I ask if you have any more pics of this one ? please mail me on yasbux@gmail.com that use to be my Dads Furniture Store on the ground floor of that Building.